Inspector Liam McCollough has captivated Winifred "Wink" Hadrian since she was fifteen years old. Though her strengths lie with all things mechanical, even she could see the haunted loneliness in his eyes the day her adoptive parents wed. It has been enough to make her yearn to be the one to soothe that ache. She just had to grow up first. Unfortunately, when she finally does, Liam has other ideas. Wink deserves someone far better than he, safer and more stable, and Liam knows that the beast inside him is none of those things. One of his best friends, however, is. He's a Knight of the Round Table and would make Wink the perfect husband. Maybe once she's married Liam will finally stop dreaming of her. That is if he can control the possessive fury that stirs his beast whenever he sees her with another man. It becomes obvious that fate has other things in store for them both when Wink comes to him for help after the son of a friend from her old life goes missing. The investigation throws them into very close and frequent contact even as it uncovers some disturbing facts about odd disappearances all over the city. As the tension mounts and the danger rises, Liam is finding it harder and harder to imagine his life without Wink in it...but the threat to crown and country could result in just that. Starting a series anywhere but at the beginning is always a crapshoot, but Pape did a nice job with the plot of this book. The main story arc was layered and suspenseful, and any series arc elements remained ancillary to the external conflict and the romance. While I did feel a lack of emotional connection to some of the secondary characters who had obviously been previously introduced in the series, it didn't at all negatively impact my ability to understand the world or follow the story. I will admit, some aspects of the world and story struck me as a little odd, but that's not uncommon when I jump into an existing series somewhere in the middle. I think that's just a result if missing out on the learning curve and detailed explanation of mythos that generally builds in the first few books in a series. I will say, the more I read in the steampunk genre, the more I enjoy just about everything about it. In this one Pape had a goldmine in Wink, who was exactly my sort of female protagonist. Keenly intelligent, impatient with society's limitations, free-thinking and spirited, she's great. By far my favorite character in the book. Liam, though he had his charms, wasn't quite as appealing to me. In his defense, he had his reasons (such as they were), but there's little that annoys me faster than a guy who makes unilateral life decisions for the woman he's interested in. As a source of relationship conflict, it's not one that works for me, so Liam's attempts to get Wink married to his friend frustrated more than it entertained, even as I got a chuckle whenever he got growly about seeing them together. The issue with the friend persisted long into the book, too, seriously impinging on the evolution of the romance between the main characters. As a result, it felt like there was a severe lack of any significant romance in general, with the vast majority of the plot focusing on the investigation into the rash of disappearances. Those were some dark, ominous, suspenseful threads that I enjoyed for most of the book, but the lack of romance disappointed. I did think the story bogged down a bit as it started to approach the climax, the mystery elements loosing a little suspense as the lack of answers dragged on and on. The climax itself also had some elements that I couldn't quite connect to. It was really the first time I felt not reading the earlier books had noticeable impact on my appreciation of the read. Though not without its issues, I still enjoyed much of this book, and I have a renewed appreciation for Pape, whose work I was previously only marginally familiar. She's an author to keep an eye on in the steampunk genre. Her authorial voice and the definition in her female protagonists are a boon for me as a reader, and I'm greedy with things like that. I look forward to more. 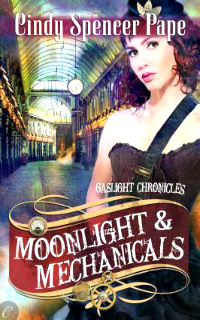 Moonlight & Mechanicals is a ripping good steampunk read! I found this book interesting, in that I feel like it elaborated the Steampunk concept more than anything I've previously read on the subject.